Introduce the splendour of Broadway music to your children with the Broadway Baby series! Now you can share and enjoy Rodgers and Hammerstein’s classic Do Re Mi from The Sound of Music with your children in this gorgeously illustrated book. 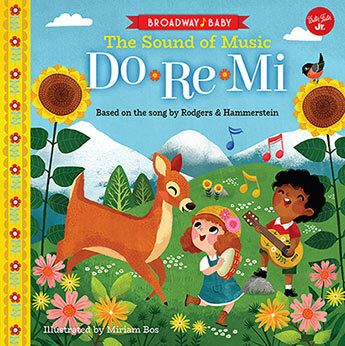 The first title in the series, Do Re Mi pairs the famous lyrics with beautiful and sweet illustrations that help bring the classic songs to life. Kids will find it super easy to read - or sing - along to this classic Broadway hit. A perfect addition to any child’s bookshelf, especially in a warm home that’s always full of music. Richard Rodgers and Oscar Hammerstein II are the legendary creators of an array of famous Broadway musicals, including The King and I, South Pacific, Oklahoma!, and Carousel. The Sound of Music was their final collaboration, which was made into a film in 1965 that won five Academy Awards, including Best Picture. Miriam Bos is an illustrator and pattern designer who enjoys creating art that makes people smile. As a nature lover, she loves taking long bicycle trips in the forest surrounding her home to find inspiration and adventure. Her illustrations have been featured in several childrens books and magazines, and she has also designed two fabric collections for Birch Fabrics.